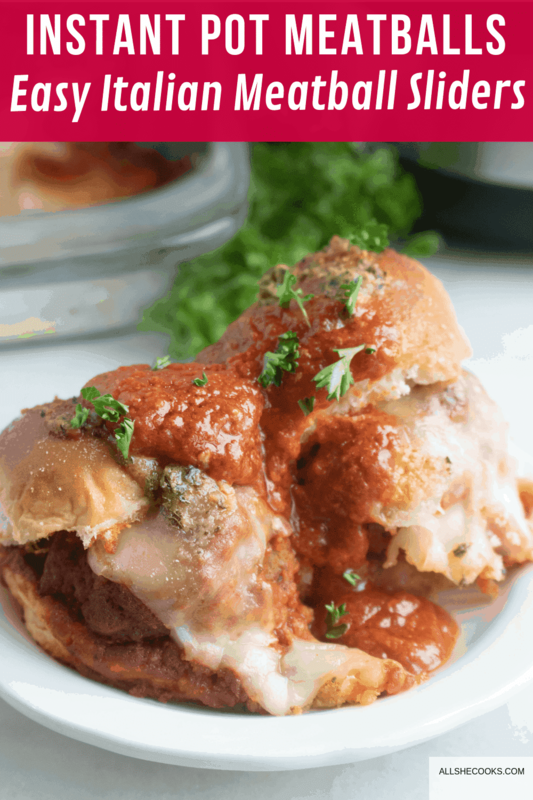 Transform delectable Instant Pot Meatballs into something even more amazing – Easy Italian meatball sliders! 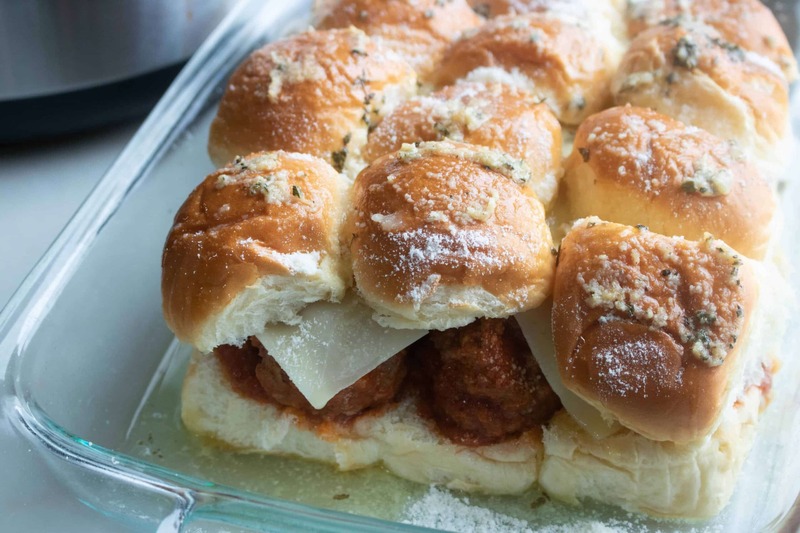 Each slider contains a classic Italian meatball smothered in rich tomato sauce and melty cheese, tucked inside a pillowy Hawaiian roll. These flavorful, bite-sized morsels are real crowd pleasers, and are perfect for serving up as a fun lunch or dinner, a great game day snack or a tasty happy hour bite. And once you try them, you may not be able to stop at just one. 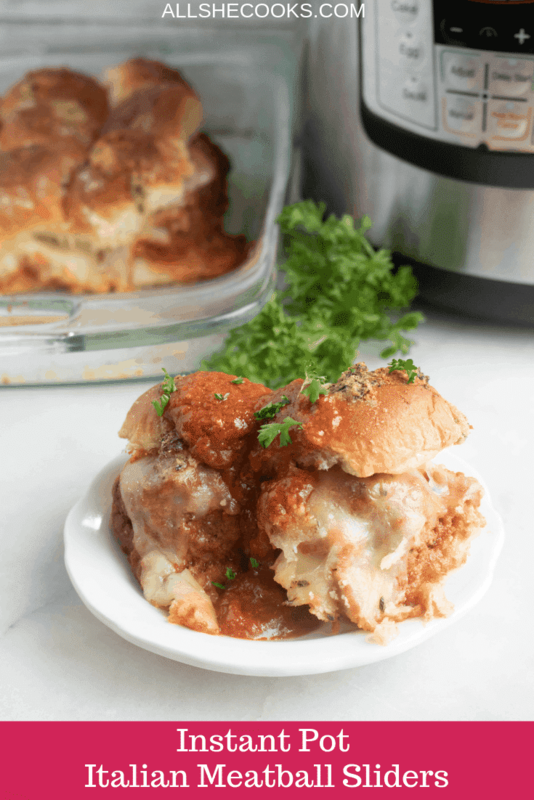 It’s so easy to make meatballs in the Instant Pot! No browning required. 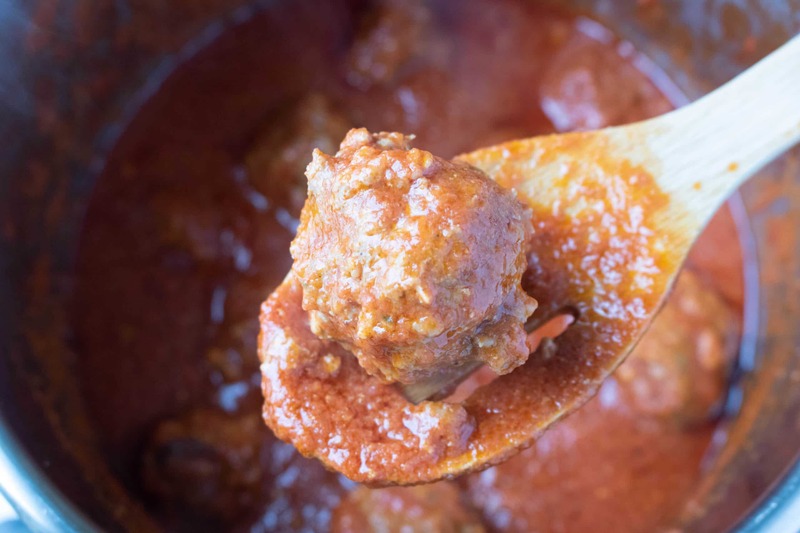 Just form the meatballs, place in the Instant Pot along with the sauce, set it and walk away! Instant Pot meatballs taste better too. By cooking them right in the sauce they turn out so much more tender and flavorful. Plus they retain their shape and don’t can crumble and fall apart, which can happen when baking or pan frying. And Instant Pot Meatballs are so versatile. 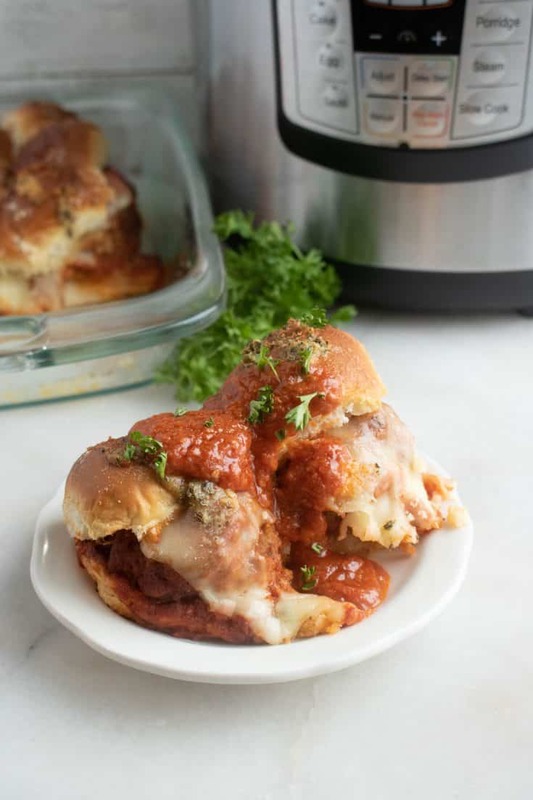 In addition to this recipe for the most delectable Italian meatball sliders, you can use Instant Pot Meatballs to serve up a classic Spaghetti and Meatballs dinner. Or swap the spaghetti for some ‘zoodles’ (zucchini noodles) and you have a healthier, but still hearty meal. Instant Pot Meatballs are also a great make-ahead solution. You can easily whip up a batch and then store in the fridge or freezer to have on hand for your meal prep throughout the week. Step #1: Mix ground beef, Italian sausage, eggs, bread crumbs, 1/3 cup grated Parmesan cheese and next four ingredients together using a hand held mixer. 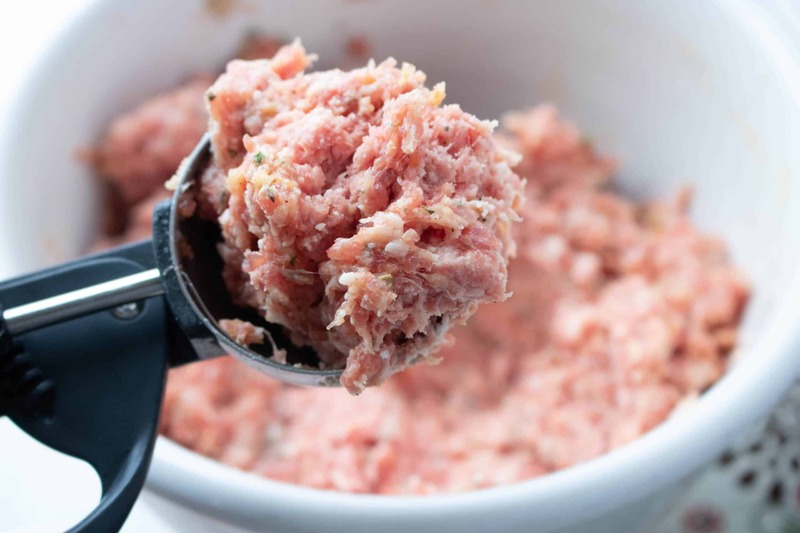 Then use a large scoop to form meatballs that are about 1 ½ inches round. Step #2: Pour half of the tomato sauce into the inner pot of the Instant Pot and place meatballs on top of the sauce. Then pour the remaining sauce over the meatballs. Step #3: Close lid on the pressure cooker and turn pressure valve to sealing. 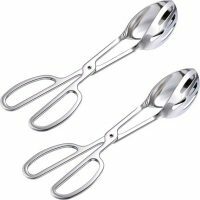 Set for a high pressure cooking time of 5 minutes, allowing for a quick pressure release when the cooking time has finished. Step #4: Next, preheat oven to 350 F and spray a 9×13 casserole dish with non-stick cooking spray. Step #5: Place the bottom of the slider buns inside the casserole dish. When meatballs have finished cooking, place on buns along with some of the sauce. Add cheeses and then put on the tops of the buns. Step #6: Melt butter and mix in garlic powder and dried parsley, then brush over the top of the slider buns. Step #7: Bake for 10-15 minutes, or until the cheese has melted and the tops of the buns are lightly golden. Then serve and enjoy! Instant Pot Lasagna Fiesta Style. Poor Man’s Beefy Tomato Macaroni Instant Pot Soup. Instant Pot Tomato Chicken Penne Pasta. 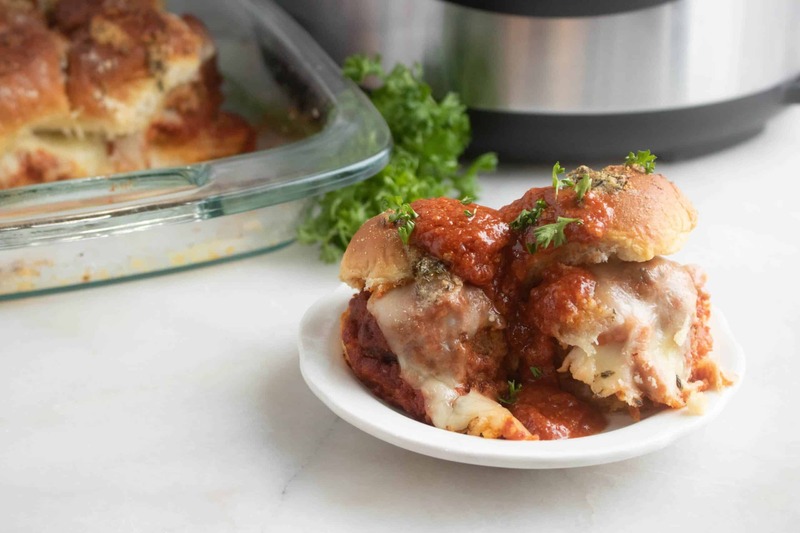 These Instant Pot Meatballs are perfect for making Easy Italian Meatball Sliders. Mix ground beef, Italian sausage, eggs, bread crumbs, 1/3 cup grated Parmesan cheese and next four ingredients together using a hand held mixer. 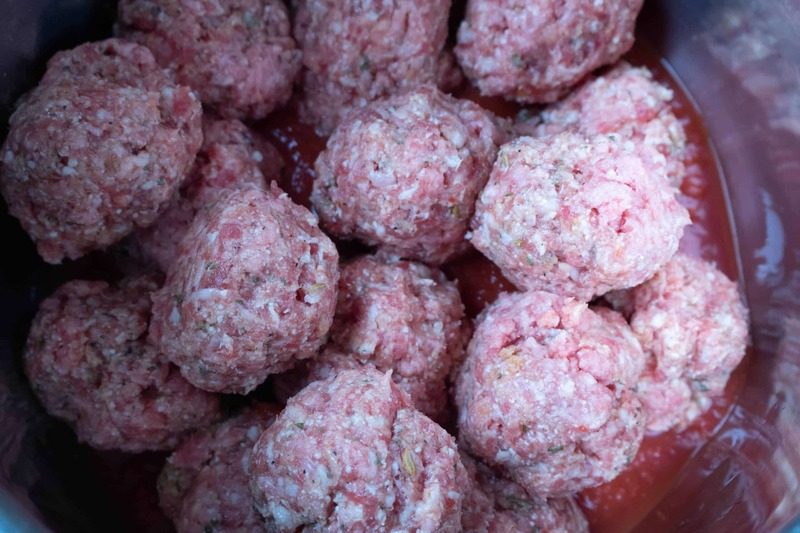 Using a large scoop, form meatballs that are about 1 ½ inches. Pour half of the tomato sauce into the inner pot of the Instant Pot and place meatballs on top of the sauce. Then pour the remaining sauce over the meatballs. Close lid on the pressure cooker and turn pressure valve to sealing. Set for a high pressure cooking time of 5 minutes, allowing for a quick pressure release when the cooking time has finished. Preheat oven to 350 degrees, and spray a 9x13 casserole dish with non-stick cooking spray. Place the bottom of the slider buns in the casserole dish. When meatballs have finished cooking, place on buns along with some of the sauce. Add cheeses and then put on the tops of the buns. Melt butter and mix in garlic powder and dried parsley. Then brush over the top of the slider buns. Bake for 10-15 minutes, or until the cheese has melted and the tops of the buns are lightly golden. Tried this yesterday. It was amazing! Sounds so good! Putting it on my meal plan.